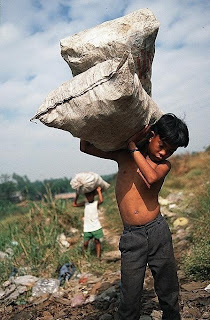 I had a heated conversation the other day about child labour. We were all parents and we were all agreed that it child labour was appalling. It was only when we got to the issue of what to do about it that things got strained. The consensus seemed to be to boycott products from companies that employ children. I begged to differ (I was in a minority of one at this point needless to say). The way I see it the immediate alternatives to working for the estimated 191 million economically active children in the world are begging, crime, prostitution or becoming a soldier - more or less in that order. Or worse: slavery (for over 8 million children). All options that are even more appalling. The consensus naturally was that they should be educated and only then become workers. I would wish that too. Of course schools are available for many of the children affected - access is not the (main) problem. Rather it is the economic cost to the child's family that is the main barrier to their becoming full time students. Only economic growth will change that - as it did for Ireland when we transitioned (over generations) from a country where most people finished their education after primary school to one where the majority go on to third level. It didn't happen overnight. We all get confused about the contradictory messages that life and politics send. Life sends the message, "I'd better not be poor. I'd better get rich. I'd better make more money than other people." Meanwhile, politics sends us the message, "Some people make more money than others. Some are rich while others are poor. We'd better close that 'income disparity gap.' It's not fair!" Well, I am here to advocate for unfairness. I've got a 10-year-old at home. She's always saying, "That's not fair." When she says this, I say, "Honey, you're cute. That's not fair. Your family is pretty well off. That's not fair. You were born in America. That's not fair. Darling, you had better pray to God that things don't start getting fair for you." What we need is more income, even if it means a bigger income disparity gap. It might seem harsh - but that's the way it is, for now. With growth, today's child labourers may grow up to be able to afford to send their children to secondary school and even to university. But it won't happen overnight. Though I do think it will happen sooner if we adopt the reality-based methods of entrepreneurs like Iqbal Quadir - developer of GrameenPhone. I really hope so - for all the children, including my own. I don't want them to grow up in a world where poverty continues to force hundreds of millions of parents to send their children to work. That would be appalling. Will Carbon Footprints get the Boot? What If There Was No TV?